Atika System’s LTC Unit unwind and coat adhesives on loop material and frontal film products to be applied directly onto diapers on the baby manufacturing line. 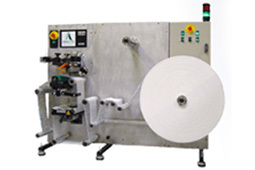 Diaper manufacturers who use this equipment are able to handle larger rolls of tape, improve the bond quality onto the diaper and save on raw material cost. Larger rolls mean fewer stops for change over and less waste of material, which result in a greater manufacturing efficiency. Atika System’s Hook Tape Lamination Unit applies Hook and Loop mechanical closures directly to diapers. Diaper manufacturers who use this equipment are able to use larger rolls with less splicing and increase their output efficiency. Depending on production levels, return on investment can be less than one year. Please contact us to further discuss advantages and benefits.